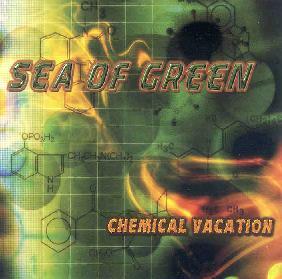 Sea Of Green - "Chemical Vacation"
Well, I had very high expectations for this CD as I really loved the first CD-EP and the 2nd one (Time to Fly) was quite good as well. What happened to this band? All the cool elements that made this band original and the slight psychedelic flavour are completely lost on the new CD. The new CD is quite hard and a cross between Alice in Chains, Soundgarden and Nirvana with very little Sea of Green left. If you like the 90’s grunge scene stuff and want to hear it done by a Canadian band, check this out but if you were expecting a cool follow up on the original sound the band had, it is nowhere to be found. One highly disappointed fan. For more information you can visit the Sea Of Green web site at: http://www.seaofgreenrocks.com.